(CNN) -- Long after the suntanned crowds pack up their umbrellas and chairs and the tide has washed away that day's sand castles, Clover slowly makes her way onto the beach. It is usually the middle of the night, when the beach is quiet and intentionally darkened. Nearby lights from streets and buildings are shut off in expectation of after-hours visitors such as Clover, an endangered leatherback turtle. "We have such a good feeling for this turtle. She has just kind of struck a nerve with all of us," said Kelly Martin, a biologist with the Loggerhead Marinelife Center in Juno Beach, Florida. "Everybody's got a little soft spot for her." The special affection for Clover comes from her disability; she is missing her rear flippers. According to Martin, the scars indicate that the flippers were bitten off by sharks. 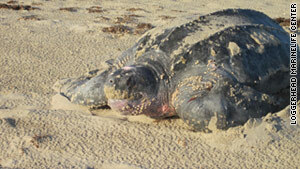 Clover, an endangered leatherback turtle, got her name from a family vacationing from Vermont. Clover is Vermont's state flower. "With no rear flippers, leatherbacks and any sea turtle are not able to dig a proper egg cavity," Martin said, "so they end up depositing their eggs on the sand, and they don't survive." Leatherback eggs that are properly nested have only a 30% to 40% chance of hatching. "Most of those hatchlings won't survive more than a week," world-renowned turtle expert Peter C.H. Pritchard said. "The clutches are fairly large: They average 80 or more eggs in a clutch, and so one wants to make sure in general that as many eggs hatch as possible and then let nature take over." Martin's team gives nature a hand at the start of the reproduction process by digging Clover's nests. While on the beach collecting data on the leatherback population in northern Palm Beach County, they always keep an eye out for their special turtle. The person who spots Clover coming ashore stops work to dig a 3-foot hole that she will use to deposit her eggs. The first encounter with Clover was in 2003, when she was missing only one flipper. Also on the beach that night were a woman and son vacationing from Vermont. "The biologist that found her asked them if they wanted to name her," Martin recalled, "and they chose the name of the state flower from Vermont, a clover." Although Vermont's flower is the red clover, this turtle seems to have the luck of a four-leaf clover. "If she was to show up somewhere else, no one would be out there looking for her. It's just odd to us, and it's kind of ironic that she comes back to this beach where people are out there looking for her," Martin said. When Clover was found on the beach in 2007, her second flipper was missing. Her injuries turned the turtle researchers into turtle midwives. "She still has the very base of that flipper," Martin said as she described the digging process, "so that's moving as she is trying to dig, and as she puts one flipper in, we take our hand and scoop out some sand. She'll switch sides and put the other flipper in. We're just kind of moving with her and trying to stay out of her way." After the eggs are deposited, the hole is filled. Clover helps pack the sand with the base of her flipper. Everybody's got a little soft spot for her. Pritchard's studies have found that nesting is hard-wired into turtles; they "haven't a clue" why they are there. Leatherback turtles nest every 10 days, and they will lay eggs six to 10 times in a season. The turtle season on Florida's Atlantic coast runs from May until mid-June. "If you are there to make an artificial nest hole by hand, they don't exactly say thank you," Pritchard said, "but I think they're thinking it, because once you dig a hole of the appropriate depth, they will fill it with eggs for you." Clover must be very thankful. This season, with a little help from her friends, she has filled seven holes.